Yesterday, we had a bit of fun shooting our gorgeous French intern Marion who after two months with us, is now leaving at the end of this week to go back studying. I’m talking fur (fake of course) sleeveless jacket on top of a stylish black blazer, jeans shorts paired with biker boots…White romantic top on skinny jeans…. Marion rocked the ‘rock chick look’ big time. 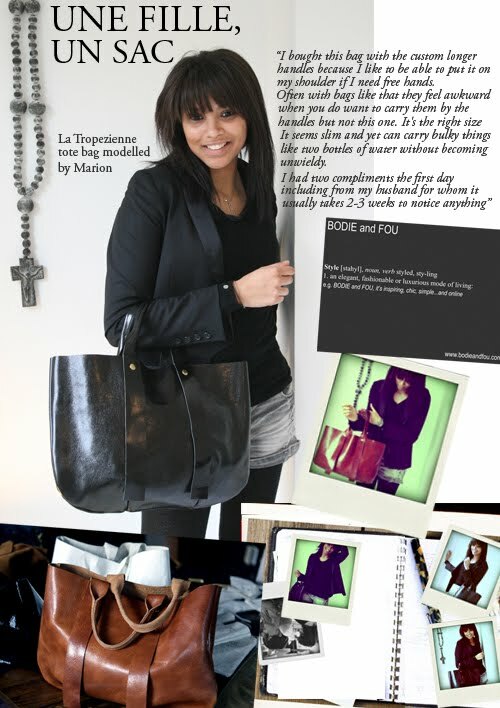 Coming over for a 2-month internship with us, she brought no less than 4 handbags in her luggage (and she will go back with a gift from us that will make it 5) so of course, it was pretty obvious that she would be the perfect girl to model the black version of La Tropezienne tote bag. And as I was looking at all the shots and this gorgeous black La Trop unpacked, I was wondering if it would be really indecent to treat myself with the same bag in a different colour…. Oh my god, she is GORGEOUS. I HAVE TO REBLOG THIS!! May I? Next PostThe story of a hat….